Spotted: Successful senior at IHA, leaving footsteps most seniors would be petrified to walk into! As most of us know by now, the girls of Immaculate Heart Academy are exceptional in almost all walks of life. We study, participate in extracurricular activities, and make time for a social life. Balancing all of the above is not an easy task. It can sometimes get competitive, in the classroom as well as on-line for locker break cookies. 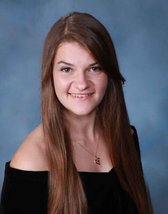 Senior Monica Traupmann knows the struggle, and her dedication paid off as she came out on top as valedictorian of the IHA Class of 2015. This was no easy feat, considering the rigor of the courses she took during her time at the Academy. She took every honors class she could, as well as six AP classes during her junior and senior years, including Chemistry, English III, English IV, US History, Biology, and Calculus. Studies were definitely not Monica’s only accomplishments. Monica started out as an ORB staff member sophomore year, working her way up to literary co-editor during her years as an upperclassman. She was a member of NHS, math league, science league, and the knitting club. Outside IHA, she dances with GDSP, sings choir at her local church, and is a very active member of the Sussex County Youth Orchestra. Although IHA girls never really get a break, Monica uses her extra time outdoors. “I love to hike, rock climb and explore”, says Traupmann. This is an activity that she has combined with her compassion to volunteer with Peak Potential, an organization that helps disabled children to climb. Traupmann attributed herself being an inspiration to the inspiration she got from the Academy itself. She is forever grateful for her time at IHA, saying that she is going to miss the people the most. “I’m actually terrified of losing the best friends I’ve made at IHA. I’ve been encouraged by this community and totally accepted, and such a thing does wonders for one’s sense of self,” she says. Monica will be attending Stevens Institute of Technology next year in the Pinnacle Scholars Program to major in Chemistry. After college, she plans to go straight to graduate school and hopes to end up doing research in Chemistry. We know she will do great and IHA wishes her the best of luck!